A guide to the biggest and most anticipated game of the year. It provides a step-by-step walkthrough of the entire single-player story and strategy for every action-packed mission, enabling you to get the most out of GTA. Get five times the action with the only official guide to the biggest Grand Theft Auto game ever! 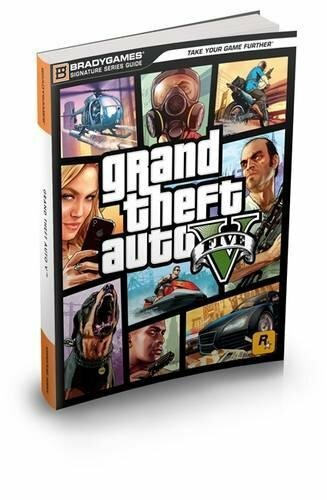 BradyGames has teamed up with Rockstar Games to bring you Grand Theft Auto V Signature Series Guide, a comprehensive guide to the biggest and most anticipated game of the year. Provides a step-by-step walkthrough of the entire single-player story and strategy for every action-packed mission, enabling you to get the most out of GTA and complete the game faster than your friends! Get complete coverage of all off-mission activities and sophisticated mini-games. Maps identify key objectives, specify targets, and chart the fastest path to success in this enormous world that's bigger than Red Dead Redemption, GTA IV, and GTA: San Andreas combined. Plus, get the inside story on the three playable characters and learn about their personalities, motivations, and skill-sets. Set in the sprawling, sun-soaked metropolis of Los Santos, Grand Theft Auto V centres around three very different criminals all plotting and scheming for their own chance of survival and success. Running out of options, Franklin, Michael, and Trevor risk everything in a series of daring and dangerous heists that could set them up for life or send them straight to the slammer. GTA V is available for XBox360 and PS3 and perfect for fans of this record-breaking game series. Take your game further with Grand Theft Auto Signature Series Guide and BradyGames.